Many pet owners are switching to a raw food with the hope of extending their pet’s lives and increasing their activity. We generally take good care of ourselves but only recently have we emphasize taking care of our pets as well. Here is how we selected our top 5 raw cat food options available right now! Raw cat food is such a new thing, how do you know which options are good and which options are just a hefty price tag? The difference is always in the ingredients list, and the best way to find out what is best for your cat is looking at their primal needs. Usually, people look to raw cat food as a treat more than a meal replacement, but if you’re looking for the best, your cat won’t need kibble anymore. You want something that can serve as a balanced meal but bring in some extras too. Most dry or wet cat foods will use grains or corn as a filler. Occasionally they’ll use rice which isn’t as bad as wheat or corn, but still not a great option. Would a cat eat rice in the wild? Probably not. The key to getting everything from a raw cat food diet is variety in meats. Fish will deliver a great balance of Omega 3 and 6 fatty acids while the chicken is vitamin rich. Beef is full of hearty protein that will help with lean muscle maintenance and development. You might want to find a company that offers a wide array of recipes to get all the extra benefits of a raw cat food diet. You can find frozen raw food, but there’s a big difference between freezing something and then something that is freeze-dried. Freeze-Dried food is usually flash-frozen and will hold its nutrients for much longer. Not to mention that it’s the best form for raw food because it will retain its flavor as well. Anyone who’s had to deal with a picky cat before will know that there’s a significant chance that you’ll go out, spend money on high-quality food options, and then your cat will refuse to eat. Fortunately, freeze-dried foods often retain their flavor, but don’t have the smell that comes with wet cat food. Making freeze dried food a top choice for people with picky cats. There is such a thing as too dry when it comes to raw food. Because raw food is usually freeze-dried pet owners will often rehydrate the food for meal times. But, the level of dryness can deter some picky cats. Occasionally some brands will have food that falls apart or is dusty or powdery. Dryness is usually a problem in recipes that are entirely meat. The fibers of the meat are known to freeze with layers of separation. But, when you add fresh vegetables or fruits into the mix, they can absorb some of the moisture and as they are reheated release it back into the mix. Although you want to ensure that you’re getting enough fruits and vegetables mixed in to solve the over-dry problem that can come with raw cat food, you want to maintain a high protein percentage. Cats would only be inclined to eat protein in the wild and the protein can not only help their diet but their behavior as well. High protein recipes should have the first ingredient as meat. Watch out for recipes that show the first three ingredients as any “meal” or “by-product” as neither of these over-processed ingredients should be in any raw food option. The meal and by-product help to boost energy but only because they’re eating parts of the animal that they wouldn’t eat in any other scenario. A cat food equivalent of hotdogs or chicken nuggets. Completely grain-free and reported as delicious, these mix-ins can stand as a real meal with a bit of water and heating. If you’re transitioning your cat from wet cat food to a raw diet, you might want to change out water for chicken or vegetable broth to emulate the texture and stronger taste of canned wet food. 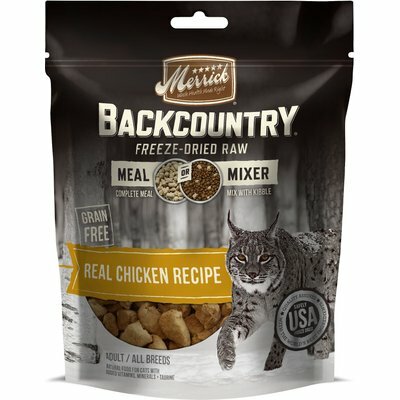 The Merrick’s Backcountry Grain-Free Meal Mixer with Real Chicken is full of vitamins and minerals, however, does miss out on both Vitamin A and B as part of a cat’s nutritional needs. We enjoyed that Merrick’s Backcountry Grain-Free Meal Mixer with Real Chicken is 38% crude protein. This percentage far surpasses nearly all wet foods and even some dry foods. The first three ingredients are chicken, chicken liver, and chicken broth which work together to provide a protein-rich formula. The only downside is the lack of vitamin A and B. A handful of the vitamin Bs that you would usually find in any cat food are responsible for maintaining proper skin and coat care. The vitamin E supplement may help with the skincare, but it can’t replace the vitamin B that their delicate skin needs. Overall, this is a great mix-in and a quality option for any cat. But, you should look to bring in some variety from other brands as Merrick’s doesn’t focus on providing a complete nutritional package. If you’re looking for an outstanding way to introduce your cat to raw foods, this recipe is an excellent place to start. The price isn’t terrible so far as raw foods go, and it’s freeze-dried so it can last for a long time. The caloric content is valuable, the protein is high, and the fiber is high as well. Cat’s that are known to be picky take to the formula well which is always a relief to cat people! 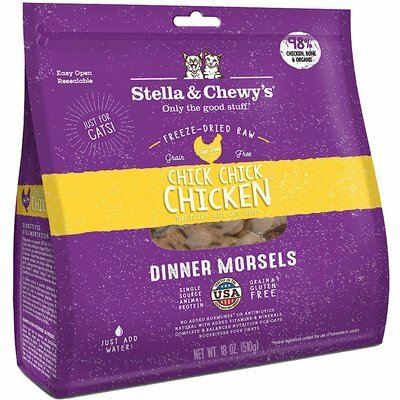 Stella and Chewy’s Chick Chick Chicken Dinner takes a page out of the dry food formula’s book and uses chicken that is ground with the bone to boost the protein percentage. They also use a variety of fermented and dried products to give a vitamin and mineral boost. Fenugreek seek, taurine and dried kelp all contribute to the improved health and activity that many Stella and Chewy’s Chick Chick Chicken Dinner users report seeing within the first week! We like the protein percentage and the fiber percentage and that these are both achieve through alternative ingredients such as fenugreek and pumpkin seeds. The alternative ingredient options along with the high volume of supplements allow for a complete meal without switching difference recipes every so often. On the label you’ll see “limited ingredient,” but when you look at the ingredient’s list, you’ll see a group of words straight from science fiction and the list stretches out for miles. The fermented and dried products on the ingredients list contribute to the over-dry or powdery texture that some cats avoid avidly. If your cat is a fan of Stella and Chewy’s freeze-dried raw cat foods, then you do not need to worry about, but if you’re looking for something new to try on your cat you might start by adding these into some wet food. Then when you move on to using this full food time, you will want to ensure that you use extra water when rehydrating. The dried and fermented products can cause the mixture to stick together so be sure to toss the food with a fork before serving to make it seem more appetizing. When your cat warms up to Stella and Chewy’s Chick Chick Chicken Dinner, you will see all the benefits of what a 45% protein formula can do for your fur baby! 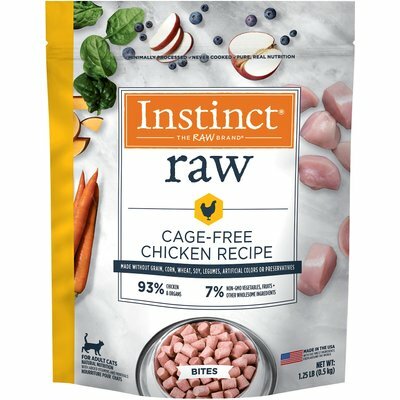 Unlike other options that focus on the mix-in option, Primal Chicken and Salmon Formula Nuggets are meant to take the place of wet or dry food and stand in as a full meal. After reading the ingredients list and nutritional information, you’ll start to wonder why Primal doesn’t make food for humans! The care that went into choosing the proteins for this formula is outstanding. The chicken is antibiotic, hormone and steroid free which can be hard to find. But the salmon is also real salmon, not imitation fish. The produce is all certified organic, and the minerals and vitamins are unrefined to offer a better balance of nutrition. There’s not anything to dislike about this product. The price is a little high, but the 14-oz bag is full of dehydrated food, so with rehydration, you’ll get more than just a few days of feedings from this order. Overall, we’re not sure if you could find better food in any form for your cat. The organic ingredients, strong protein blend, and variety make this a top-notch recipe! The instructions for rehydrating guide pet owners into using goats’ milk which is more nutrient dense and easier to digest than cow’s milk. The Nuggets are decently sized, and the serving sizes are mapped out “per nugget” so it’s easier to be sure that you’re giving the proper serving size with this food than with dry foods. Nature’s Variety delivers Instinct. A package of frozen bits of raw food that are regularly used to mix into other food or serve as a whole meal. The split between protein and fruits and vegetables that Nature’s Variety has found works best for them is an 85/15 divide. They also use only whole-food ingredients to help develop lean muscle and build energy. Without a doubt, the whole-food ingredients sell this product. The ingredients list contains everything from chicken liver to apples and even butternut squash. While they do use some supplements for Vitamin E and Thiamine, they rely mostly on fruits and vegetables to deliver high volumes of Vitamin A and B. The downside is that the only protein is chicken which doesn’t deliver an exceptionally high protein content. The crude protein percentage in this recipe is about 12%, and that is fairly low compared to wet or dry options. Initially, the price seems pretty good for what you’re getting in raw food. But, this food isn’t freeze-dried or dehydrated. The frozen chunks are essentially reheated and then served. For pet owners, you may be buying a new bag every week or even a new bag every 4 days if you have a heftier cat. The recipe, however, does have a major advantage over other raw cat foods, and it’s that this formula works well for weight loss. If you’re looking for a healthy way for your overweight cat to lose some weight, you should consider switching to this option! 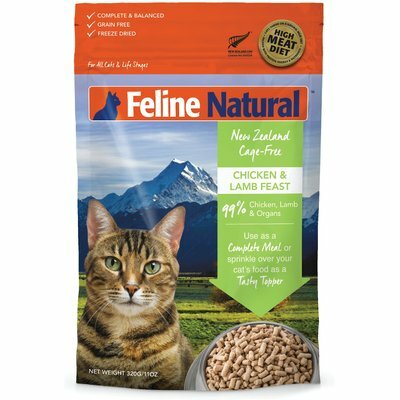 The Feline Natural Chicken and Lamb feast use not only chicken and lamb but also New Zealand Green Mussel which has helped boost their protein and nutrient density. The dried kelp and flaxseed are great ways to help your cat build energy and care for their skin as well. We enjoy that Feline Natural went for a wider range of protein blends. Although they use chicken and lamb, with mussels as a bonus, the lamb is also very high in fat. The tradeoff is great for cats that only need to maintain their weight. The downside is that nearly all of the vitamins are supplements and there are still a few missing. They opted out of vegetable choices to use supplements instead. They could have had a heartier recipe, but they missed their chance. If you’re new to raw food, or you want to give it a try without breaking the bank, this formula is a great option. Feline Natural offers a lot in the way of diverse protein, but when it comes down to complete macronutrients, it’s missing out a bit. Primal Chicken and Salmon Formula Nuggets take the top spot when it comes to raw food. These are highly recommended because of their strong ingredients list and super nutrient dense formula. The 52% crude protein can outperform most dry foods that are overloaded with meal and byproduct ingredients. 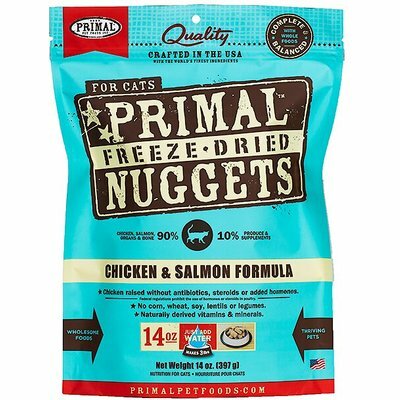 Primal Chicken and Salmon Formula Nuggets use chicken, chicken organs, salmon and a blend of fruits and vegetables to create a rehydrated texture that is appealing to cats. The proteins here are blended to offer both Omega 3 and 6 fatty acids as well as help to develop lean muscle mass. Possibly the only thing to watch out for is that you don’t overfeed your fur baby. Because the fat content is so high, it would be very easy for a healthy cat to put on weight if you leave a bowl out overnight.